Australian scientists have identified a potential treatment to combat malaria. The malaria parasite produces a glue-like substance which makes the cells it infects sticky, so they cannot be flushed through the body. The researchers have shown removing a protein responsible for the glue can destroy its stickiness, and undermine the parasite's defence. 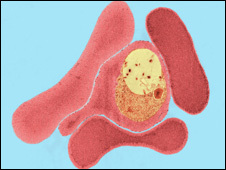 The malaria parasite - Plasmodium falciparum - effectively hijacks the red blood cells it invades, changing their shape and physical properties dramatically. Among the changes it triggers is the production of the glue-like substance, which enables the infected cells to stick to the walls of the blood vessels. This stops them being pased through the spleen, where the parasites would usually be destroyed by the immune system. The Australian team developed mutant strains of P. falciparum, each lacking one of 83 genes known or predicted to play a role in the red cell remodeling process. Systematically testing each one, they were able to show that eight proteins were involved in the production of the key glue-like substance. Removing just one of these proteins stopped the infected cells from attaching themselves to the walls of blood vessels. Professor Alan Cowman, a member of the research team at the Walter and Eliza Hall Institute of Medical Research, said targeting the protein with drugs - or possibly a vaccine - could be key to fighting malaria. "If we block the stickiness we essentially block the virulence or the capacity of the parasite to cause disease," he said. Malaria is preventable and curable, but can be fatal if not treated promptly. The disease kills more than a million people each year. Many of the victims are young children in sub-Saharan Africa.